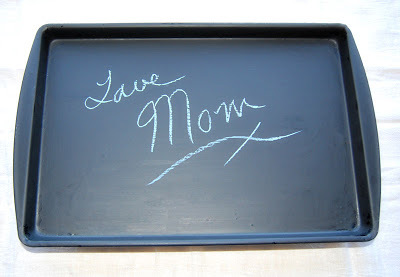 really well-used things: an old cookie sheet that has seen better days, and a baby blanket that came home with us from the hospital and in another case, some Chalkboard paint. 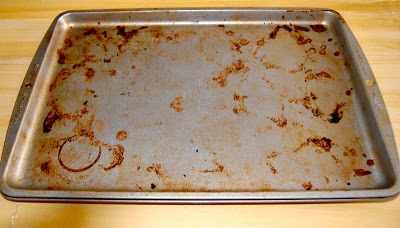 I’ve had cookie sheets in worse shape. But this one has served its time well in the oven and needs to move on to other things. 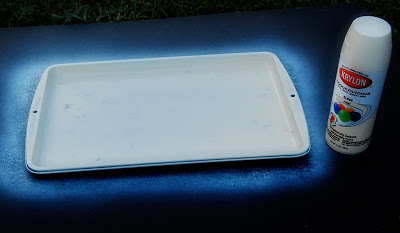 Because this cookie sheet was in such bad shape, I scoured off what I could and sanded it a bit. I used a light material to cover the pan so I needed to spray paint it a nice neutral color. 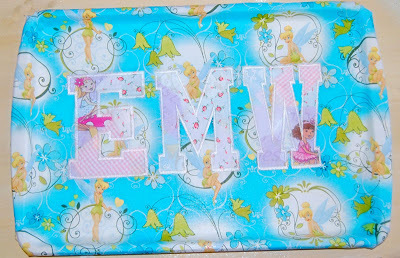 At this point I was debating whether to leave it with paint and stencil on Em’s initials, but I really wanted to play with my Embroidery machine – I wanted to take multiple pieces of material and make a rag look with the applique. Place the material over the cookie sheet to determine how much to cut off (you’ll want enough to wrap under the bottom of the pan). 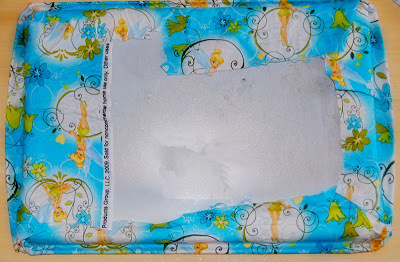 Then use the Spray Adhesive on the cookie sheet and place the fabric on the cookie sheet. Be sure to smooth it out, get it in the creases. Flip over the cookie sheet and do the same with the rest of the material. 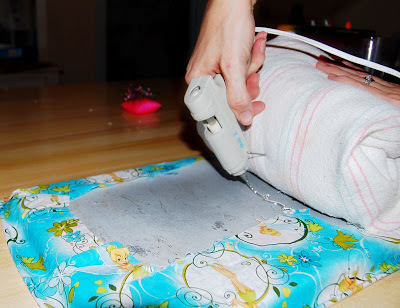 If you added some sort of applique or embroidery like I did, you’ll need to Mod Podge and sand in between layers until you get a smooth surface. It took me 7 layers. I probably won’t do that again :). 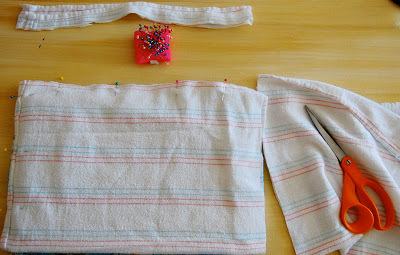 Fold the material in half, so you’ll only have to sew 3 sides, and cut to fit the cookie sheet. With right sides facing each other, pin and sew the sides leaving 5 to 6 inches open for you to turn the material and stuff. Stuff the pillow with Polyfill to a make a soft pillow then fill with about 2 cups of rice or beans (I did a cup of both). 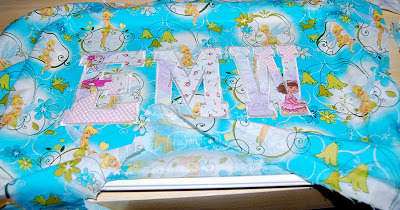 Once you have the pillow stuffed to what you'd like, whip stitch or sew the opening. 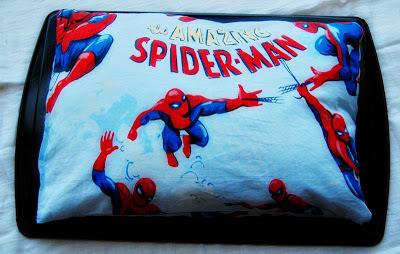 Then glue the pillow onto the back of the lap desk. And the finished product, is fantastic! 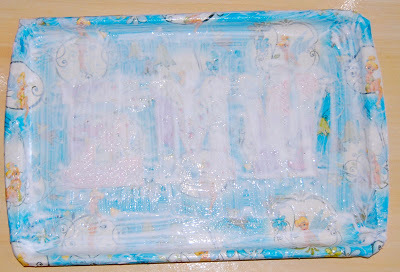 What I love about the cookie sheet is the edges; keeps the crayons on the tray. One of the differences between Em’s tray and Little Man’s is his is magnetic.